Publisher Bigben and developer Frogware Games have released a creepy new gameplay trailer for the upcoming H.P Lovecraft inspired game, The Sinking City. Be warned however, if you get a bit squeamish at the site of blood or tentacles, this game is most certainly not for you so don't even watch this trailer. Set in an open world version of 1920s New England, The Sinking City will follow private investigator Charles W. Reed as he confronts his tortured past and haunting otherworldly visions. Players will find themselves in the city of Oakmont, Massachusetts, secluded from the outside "world under a flood of supernatural origins", having to deal with the crazy locals and their corrupted minds. While we don't get too many details from the trailer, it certainly paints an ominous bleak picture of the town players will be exploring. 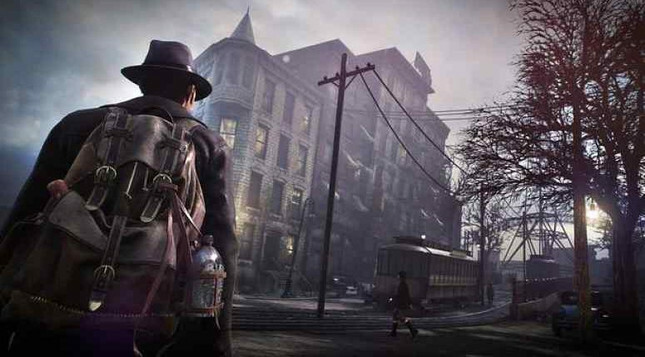 The game looks like a wonderful mix of The Evil Within and Frogware Games previous Sherlock Holmes titles. Players will be tasked with exploration and detective work, providing them with a wide variety of options when deciding on how to pursue leads. The games developers have also said that "there will be no handholding, no markers on the map, no instructions in your diary" so expect to play with a notebook at your side. I love the idea behind this, but it could prove frustrating if the games world is not well designed or filled with enough notable landmarks to keep us from getting too lost. Or maybe that's the point. It could lead to some terrifying situations when confronted by the games unknown horrors. If the new trailer is any indication of what we can expect, The Sinking City looks to be an unsettling journey, perfect for Lovecraft and horror fans alike. What do you guys think? Interested or does it look a little too B-grade for your taste? Let me know in the comments below!